Town in Sleswick-Holstein, near Hamburg. About the year 1600 Count Breido Rantzau, owner of the estate of Wandsbeck, allowed Jews to settle there in consideration of a small yearly payment for protection. Many Jews availed themselves of this permission, attracted by the town's proximity to Hamburg, where Jews were not allowed to settle at that time. According to a document of Nov. 10, 1637, Berend of Hagen, called Geist, feudal tenant of the Danish crown estate of Wandsbeck, ceded to the Jews a plot for a cemetery and permitted them "to perform their prayers and other rituals according to their customs." In 1674 the community of Wandsbeck formed together with those of Altona and Hamburg the "union of the three communities," acknowledging as its spiritual head the chief rabbi of Altona, the first being R. Hillel ben Naphtali. The three communities continued united until 1811 (see Altona; Hamburg). 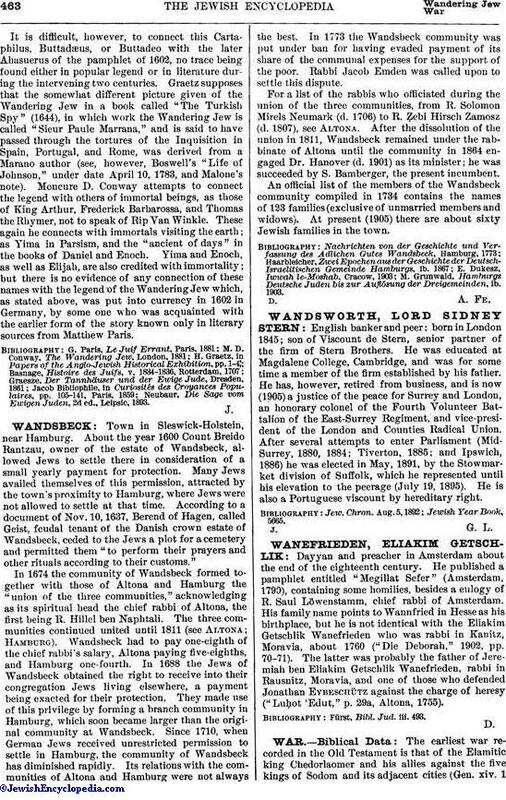 Wandsbeck had to pay one-eighth of the chief rabbi's salary, Altona paying five-eighths, and Hamburg one-fourth. In 1688 the Jews of Wandsbeck obtained the right to receive into their congregation Jews living elsewhere, a payment being exacted for their protection. They made use of this privilege by forming a branch community in Hamburg, which soon became larger than the original community at Wandsbeck. Since 1710, when German Jews received unrestricted permission to settle in Hamburg, the community of Wandsbeck has diminished rapidly. Its relations with the communities of Altona and Hamburg were not always the best. In 1773 the Wandsbeck community was put under ban for having evaded payment of its share of the communal expenses for the support of the poor. Rabbi Jacob Emden was called upon to settle this dispute. For a list of the rabbis who officiated during the union of the three communities, from R. Solomon Mirels Neumark (d. 1706) to R. Ẓebi Hirsch Zamosz (d. 1807), see Altona. After the dissolution of the union in 1811, Wandsbeck remained under the rabbinate of Altona until the community in 1864 engaged Dr. Hanover (d. 1901) as its minister; he was succeeded by S. Bamberger, the present incumbent. An official list of the members of the Wandsbeck community compiled in 1734 contains the names of 123 families (exclusive of unmarried members and widows). At present (1905) there are about sixty Jewish families in the town. M. Grunwald, Hamburgs Deutsche Juden bis zur Auflösung der Dreigemeinden, ib. 1903.